There is no way to minimize or brush aside the importance of brain health, nor the anxiety that people feel when dealing with issues of the brain and nervous system. After all, this neurological center controls everything from our decision-making abilities to how we engage and interact with the world. Neurology is the medical specialty of diagnosing and treating disorders of the nervous system which includes the brain, spinal cord, peripheral nerves and muscles. A neurologist's training includes an undergraduate degree, four years of medical school, a one-year internship, and at least three years of specialized training. Neurologists may be principal care providers, consultants to other doctors, or both. When a person has a neurologic disorder that requires frequent care, a neurologist is often the principal care provider. In a consulting role, a neurologist will diagnose and treat a neurologic disorder and then advise the primary care doctor managing the person's overall health. Neurologists can recommend surgical treatment, but they do not perform surgery. When treatment includes surgery, neurologists may monitor the patients and supervise their continuing treatment. Computerized Tomography or Computer Assisted Tomography (CT of CAT scan). This test uses x-rays and computers to create multi-dimensional images of selected body parts. Dye may be injected into a patient's vein to obtain a clearer view. Magnetic Resonance Imaging (MRI). An MRI is an advanced way of taking pictures of the inner brain. It is harmless and involves magnetic fields and radio waves. It is performed when a patient is lying in a small chamber for about 30 minutes. Transcranial Doppler (TCD). This test uses sound waves to measure blood flow in the vessels of the brain. A microphone is placed on different parts of the head to view the blood vessels. Neurosonography. This test uses ultra high frequency sound wave to analyze blood flow and blockage in the blood vessels in or leading to the brain. Electroencephalogram (EEG). The EEG records the brain's continuous electrical activity through electrodes attached to the scalp. It is used to help diagnose structural diseases of the brain and episodes such as seizures, fainting, or blacking out. Electromyogram (EMG). An EMG measures and records electrical activity in the muscles and nerves. This may be helpful in determining the cause of pain, numbness, tingling, or weakness in the muscles or nerves. Small needles are inserted into the muscle and mild electrical shocks are given to stimulate the nerve (nerve conduction study). Evoked Potentials. This test records the brain's electrical response to visual, auditory, and sensory stimulation. This test is useful in evaluating and diagnosing symptoms of dizziness, numbness, and tingling, as well as visual disorders. Sleep Studies. These tests are used to diagnose specific causes of sleep problems. To perform the tests, it is often necessary for a patient to spend the night in a sleep laboratory. Brain wave activity, heart rate, electrical activity of the heart, breathing, and oxygen in the blood are all measured during the sleep test. These tests are painless. Cerebrospinal Fluid Analysis (Spinal Tap or Lumbar Puncture). This test is used to check for bleeding, hemorrhage, infection, or other disorder of the brain, spinal cord, and nerves. In this test, the lower back is numbed with local anesthesia and a thin needle is placed into the space that contains the spinal fluid. The amount of spinal fluid that is needed for the tests is removed and the needle is withdrawn. We understand that neurological disorders can be confusing and frightening. Our goal is to help patients understand what is happening, and to empower them in making informed decisions related to their health. We see patients from nearly every walk of life: athletes coping with concussions or recurring head injuries; Parkinson’s or Alzheimer’s patients; otherwise healthy people who are dealing with double vision or another issue that comes out of nowhere. Among our areas of expertise include stroke, stroke prevention, epilepsy, movement disorders, neuromuscular disorders, multiple sclerosis, dementia, and headaches. 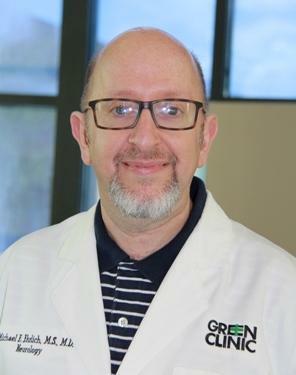 Green Clinic is proud to offer two experts in the field of neurology, Dr. Michael E. Ehrlich and Dr. Brian L. Stucki, both of whom are board certified physicians by the American Board of Psychiatry and Neurology.